With the debate pair of Ben Kuykendall and Joseph Madere assigned to tackle a contentious current news issue: comparing socialism to capitalism, the Grand Canyon University Speech and Debate Teams flourished on Saturday and Sunday at the Sunset Cliffs Classic Tournament at Point Loma Nazarene University in San Diego. Among 30 speech and debate teams, GCU finished runner-up to Concordia University of Irvine, Calif.
“I am very proud of the hard work demonstrated throughout the season, and I am excited to see some of our newer members seeing success so early on,’’ said Michael Dvorak, the Director of Forensics in reference to Angel Cruz and Sevanna Hackmann. The Speech and Debate Team placed second in the Sunset Cliffs Classic Tournament at Point Loma Nazarene. Cruz reached the finals of the senior persuasive event — her first award of the academic year. One of Cruz’s topics was persuading the judges and audience against using take-home genetic testing kits. Hackmann’s advancement to the finals of the novice persuasive event was her first award. Jess Kennedy, Tommee Gleason and Xanthia Clow led the Speech Team. Kennedy won extemporaneous and impromptu in the novice division and was named the second-ranked speaker of the tournament. 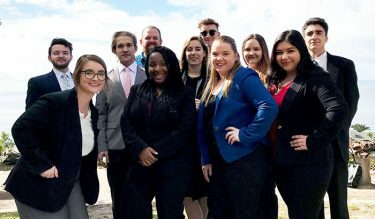 Gleason claimed a pair of third-place finishes in extemporaneous and after-dinner speaking and reached the finals in two other events, impromptu and communication analysis. Clow placed third in communication analysis and drama. Also, Sam Hesman finished second to Kennedy in novice impromptu. The debate pair of Matthew Calderwood-Grace Laidlaw advanced to the top eight in the varsity division. Kuykendall-Madere placed in the quarterfinals of the junior varsity division. Twenty GCU students attended the event, and 10 of them received an award. Next up for the teams are the national championships. The National Parliamentary Debate Round Robin will be at California-Berkeley March 1-3.